Today’s sketches come from Dan Brereton and were done at the 06 Dragoncon. That’s right, I said sketches. When I mentioned that today’s installment was the longest, this is why. Let me tell the story, and then we’ll talk about each sketch. Dan was very nice when I approached him for a sketch, it was the first time I had met him. I explained I wanted something with Polychrome and a brain jar. We agreed on a price and that’d I’d be back in the morning to pick it up. I had no idea what I was about to get. The next morning I show up like a kid on Christmas, I can’t wait to see what is in my book. 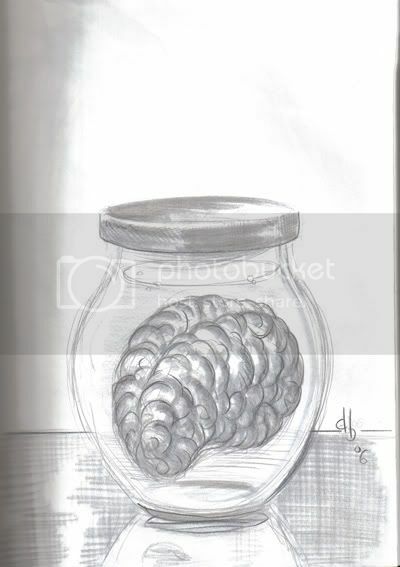 Dan shows me the first picture, the one of just the brain in the jar and tells me that since I didn’t have any good reference pictures he sketched a brain in a jar to get warmed up. I’m not worried, I’m thinking, “two sketches for the price of one.” Then he shows me the Polychrome sketch where she is either pulling the jar out or about to put it in the Gunwitch’s head. I’m floored, I love it. 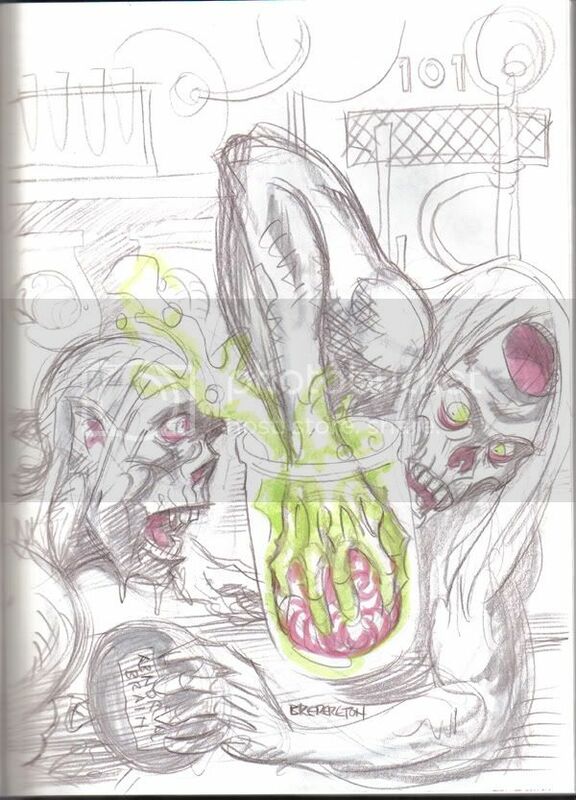 Then Dan says, “I didn’t really like it so I did this,” he turns the page and shows me the crazy zombie brain grab you see in the picture above! I was already thrilled with the first sketch and then he showed me that. But Dan doesn’t stop, he goes on to tell me that he wasn’t really happy with that one either. He flips the page again and shows me the picture right below this! Finally he was happy. As you can see from the pictures, I would have been happy with any of them. If you are unfamiliar with Dan, he is an amazing painter and story teller. His most main stream work is probably Batman: Thrillkiller. But if you really want to jump into his world you want to pick up some of his Nocturnal stories. That is where Polychrome and Gunwitch come from. 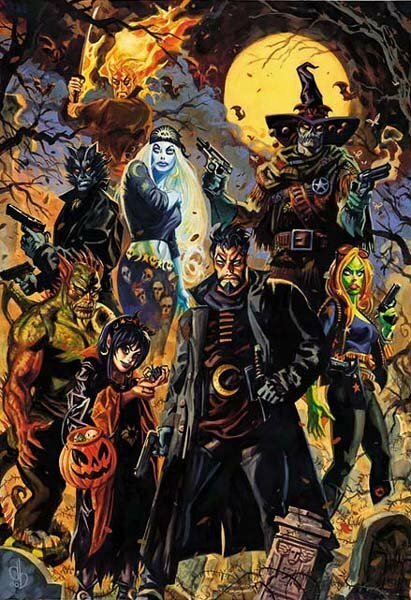 While most members of the group look like monsters they protect the city from crime and other supernatural threats. Another fantastic book to pick up is Giantkiller. In the past few years he has been doing some very cool Marvel stuff, the Immortal Iron Fist annual being my favorite, but I’m biased towards that character. So there it is, Tales #11 on 1/11/11. The timing on that one couldn’t have been any better if I planned it. Seriously, if you haven’t checked out any of Dan’s work, you need to. And thank you Dan for the amazing sketches and a wonderful story to tell about them. I'm seriously going to have to thank you again the next time our Con paths cross again. On a side note, I have no idea why my Polychrome sketch is so small; I’ll have to re-scan it at some point.